The previous blogs have gotten into how synaptic vessicles fuse with the synapse membrane. Similar mechanisms are used by viruses to enter healthy cells, and are now being harnessed for the latest genetic medical treatments: Gene Therapy and RNA Interference. Some very cool stuff happening in this area. Research into the HIV virus led to some of the first breakthroughs in understanding the membrane fusion mechanism. Retroviruses are particularly adept at invading a wide variety of different human cells, which makes them good models to study for gene therapy. Lifecycle of the virus provides a good intro to how viruses work. The HIV virus anchors itself to a special protein (CD4) on the surface of the helper T cell. This causes the viral membrane to fuse with the host cell's membrane. It's called a Lentivirus (Lenti is latin for "slow"). The aim of gene therapy is to modify the genetic material of living cells for therapeutic purposes (Amado and Chen, 1999). Gene therapy involves the insertion of a functional gene or another molecule that contains and information sequence into a cell to achieve a therapeutic effect. Thus, the gene serves as a drug (Lasic, 1997). There are two types of gene therapy: somatic cell and germ line. Somatic cell gene therapy is the only technique now in use. The purpose of the procedure is to eliminate the clinical consequences of a disease and the inserted gene is not passed on to the patient's offspring. In germ line gene therapy a healthy gene is inserted into the fertilized egg of an animal that has a genetic effect. Every cell that develops from this egg, including the reproductive cells, will have the new gene. However, there are very serious social and ethical considerations with this type of gene therapy (Nichols, 1998). Before 1996 scientists relied mainly on modified retroviruses such as Moloney murine leukemia virus when gene transfer into the chromosomes of target cells was needed, and adenovirus vectors when such integration was not needed. 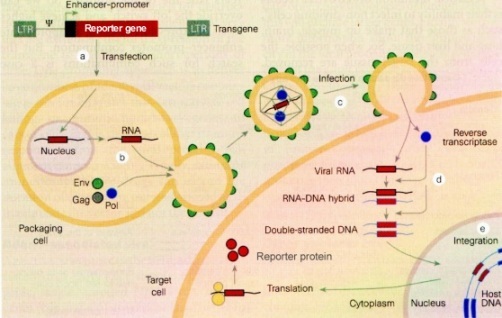 However, there has been little success in gene transfer with such virus vectors because even though the vectors can enter into their target cells, the cells need to be dividing, so that their nuclear membrane are broken down, for the gene to enter and integrate into the chromosome (Sikorski and Peters, 1998; CFAR at UC San Diego). However, scientists soon realized that members of the subfamily lentivirus, such as the retrovirus human immunodeficiency virus (HIV), would have the same ability to transfer genetic material into the genomes of cells, but could do this with non-dividing, dormant cells in vivo and growth-arrested cells in vitro (Amado and Chen, 1999; CFAR at UC San Diego). Exploring this new method of gene therapy has been the work of many labs in the past few years. Lentiviral vectors are a type of retrovirus that can infect both dividing and nondividing cells because their preintegration complex (virus “shell”) can get through the intact membrane of the nucleus of the target cell. Lentiviruses can be used to provide highly effective gene therapy as lentiviruses can change the expression of their target cell's gene for up to six months. They can be used for nondividing or terminally differentiated cells such as neurons, macrophages, hematopoietic stem cells, retinal photoreceptors, and muscle and liver cells, cell types for which previous gene therapy methods could not be used. HIV is a very effective lentiviral vector because it has evolved to infect and express its genes in human helper T cells and other macrophages. The only cells lentiviruses cannot gain access to are quiescent cells (in the G0 state) because this blocks the reverse transcription step (Amado and Chen, 1999). Scientists have recently been using the HIV lentiviral vector to repair neurons. HIV is also being developed as a delivery system to provide successful gene therapy in many diseases such as metabolic diseases, cancer, viral infection, cystic fibrosis, muscular dystrophy, hemophilia, retinitis pigmentosa, and maybe even Alzheimer’s disease (Adler, Gifford, and Sumner; Naldini et al. ; Amado and Chen, 1999; Planelles). There is still concern with using lentiviral vectors for safety reasons. One concern involves the possibility that the HIV could self-replicate and could be produced during manufacture of the vector in the packaging cell line or in the target cells by a process of recombination. Thus, the person undergoing gene therapy would also be infected with HIV in addition to the new therapeutic gene. A self-replicating infectious vector could cause cancer by inserting itself into the host genome and activate a neighboring proto-oncogene, thus causing mutagenesis (Amado and Chen, 1999). Because scientists have shown that lentiviruses, such as HIV, are successful and efficient gene delivery vehicles, the field has now turned its attention to producing vectors with built-in safety features to prevent the development of replication competent lentiviruses (RCL). However, even the earliest studies with HIV lentiviral vectors did not generate RCL in vitro or in vivo (Amado and Chen, 1999), but precautions are still very important. By using non-human lentiviruses, scientists hope to bypass the issue of host infection by the gene therapy vector. Researchers are developing non-human lentiviruses such as the feline immunodeficiency virus (FIV) to be used in gene therapy (Amado and Chen, 1999). Lots more excellent info at this site - worth checking out. There's a wonderful animation at Hybrid Medical Animation that shows viral attachment to a cell via a glycoprotein in its membrane and the resulting membrane fusion in action. Highly recommended. The diffraction pattern showed that, when the two membranes fuse, they form an hourglass-shaped structure called a stalk, confirming theoretical predictions. When the stalk stretches further, it creates a connecting bridge between the membranes. This connection then enlarges, and the two membranes ultimately become one single membrane. The production of viral particles in a producing cell line that will be able to infect target cells, but won’t be able to form a replication-competent recombinant (RCR) and subsequently infect other target cells is a feature behind the development of HIV-1 based vectors. When HIV-1 based vectors are used, the goal has been to diminish the probability of a recombination event that will give rise to full-length replicative viral DNA. This has been accomplished by separating the structural and delivery constructs onto three different plasmids. The regulatory/accessory genes of HIV-1, specifically Nef, Vpr, Vpu, Vif and Tat have been shown to be largely dispensible for gene delivery to most cell types. Although the recombination event possible between three independent plasmids is extremely small, ways to decrease even further this probability when dealing with HIV-1 based vectors have been undertaken in the plasmids presented at this site. This is the basis of the development of self-inactivating vectors or SIN vectors. Basically, a chunk of the virus that harbors the major transcriptional functions of the HIV genome is removed. The lack of active viral promoter avoids both the possible transcription of the viral sequence and detrimental effects on eukaryotic gene expression. We have recently determined the structure of the portion of a feline leukemia virus that binds a phosphate transporter as its cell-surface receptor, and we compared this structure to that of a murine leukemia virus ... which binds a basic amino acid transporter. In this figure, the polypeptide chain is represented by a ribbon, and carbohydrates and disulfide bonds are shown as balls-and-sticks. The cores of the two structures, shown in blue, are very similar. In contrast, the regions labeled "VRA" and "VRB" for "variable regions A and B," are structurally very different between the feline and murine viruses. These structures illustrate how diverse receptor-binding specificities interface with the conserved scaffolds and the shared cell-entry mechanism of this retrovirus group. The most common techniques utilized in gene therapy studies is the introduction of the corrected gene into bone marrow cells, skin fibroblasts or hepatocytes. The vectors most commonly utilized are derived from retroviruses and utilize only the transcriptional promoter regions of these viruses (the LTRs) to drive expression of the gene of interest. The advantage of retroviral-based vector systems is that expression occurs in most cell types. A number of human inherited disorders have been corrected in cultured cells and several diseases (e.g. malignant melanoma and severe combined immunodeficiency disease, SCID) are currently being treated by gene therapy techniques indicating that gene therapy is likely to be a powerful therapeutic technique against a host of diseases in coming years. The first successful examples of this type of retro-viral gene therapy were reported in August. Scientists have used viruses as a gene delivery mechanism for more than 20 years because of their adeptness at getting inside cells and inserting themselves in DNA. But efficiency comes at a price. Gene therapy trials have been halted because of major complications, including deaths. As examples, one patient died because of his immune response to an adenovirus and three children in another study developed leukemia because the virus inserted itself upstream of a cancer-causing gene. "With viruses, you don't have control," says Dr. Kaminski. "People have tried to modify viruses for site-specific integration and have not been very successful. Once they get into the cell, they can insert wherever they want." A jumping gene first identified in a cabbage-eating moth may one day provide a safer, target-specific alternative to viruses for gene therapy, researchers say. They compared the ability of the four best-characterized jumping genes, or transposons, to insert themselves into a cell's DNA and produce a desired change, such as making the cell resistant to damage from radiation therapy. They found the piggyBac transposon was five to 10 times better than the other circular pieces of DNA at making a home and a difference in several mammalian cell lines, including three human ones. "If we want to add a therapeutic gene, we can put it within the transposon and use it to deliver the gene into the cell," says Dr. Joseph M. Kaminski, radiation oncologist at the Medical College of Georgia Cancer Center and a corresponding author on research published the week of Sept. 25 in the online Proceedings of the National Academy of Sciences Early Edition. "You can use these wherever retroviruses have been used." We are developing a new class of gene delivery vectors by combining viral and synthetic components to produce hybrid, active nanostructures. Recombinant viruses by themselves are highly efficient vectors, but suffer from serious safety concerns, difficulty with redirecting cell specificity, and expensive production and purification. Polymeric vectors are potentially safer, cheaper and more versatile, but in their current form lack the efficiency needed for clinical application. Hybrid viral/synthetic nanovectors may be designed to exhibit several of the advantages (and possibly avoid disadvantages) of both types of vectors. RNAi is a natural phenomenon, found in organisms from yeasts to plants to mammals. Its normal function appears to be twofold: to protect against viruses and other exogenous gene sources, and to regulate gene expression. Both functions rely on the same machinery, which detects double-stranded RNA molecules in the cell, and prevents their translation into protein. “RNAi essentially shoots the messenger,” said Dr. Paulson, by either destroying the double-stranded RNA or silencing it without destruction. A key event in the process of RNAi is detection and cleavage of double-stranded RNA by an enzyme appropriately named Dicer, in a multiprotein complex called RISC (RNA-induced silencing complex). The resulting small RNA fragments then serve as templates for the detection and cleavage of additional RNAs with the same sequence. This is the basis for the therapeutic application of RNAi: By introducing a double-stranded RNA that matches the gene to be silenced, one can effectively prevent protein synthesis from that gene for an extended period of time. Indiana State U. has a very good Introduction to Molecular Medicine web page that provides a lot of useful info, including good descriptions of some of the key concepts (cDNA, etc.). Biosynthesis and role of filoviral glycoproteins - the article that the great picture of membranes fusing at the top of this blog came from. Discusses research into the molecular mechanisms used by the Ebola virus.